Thanksgiving isn’t the only time we are to remember what we are thankful for. God always provides for us and because of this, we should always have grateful hearts. We should always praise God for all He has given us and continues to provide for us. What were the Israelites complaining about? Who did they complain to? Could Moses do anything about it? Who should the Israelites have been praying to for water? What did Moses hit to make water? Why do you think God had him do this? Do you think it pleases God when we complain? Instead of complaining, what should we do? Sometimes we whine and complain, especially when things aren’t going our way. Other times we whine and complain when we want something. That’s when we have to ask ourselves: Do I want this or do I need this? Talk to your child about the difference between a want and a need. Despite all the miracles that the Israelites had seen, they continued to doubt God’s ability to provide for them. We should never doubt that God can provide for us. He always has and always will. Of course, it’s according to His timing and His will, but He ALWAYS provides for us! When you begin to feel like whining and complaining, praise God instead!! Praise Him for the many things that He has provided! Praise Him for the many things He has yet to provide!! Discuss the importance of a grateful heart. Read the scriptures in today’s lesson and talk about each of them. 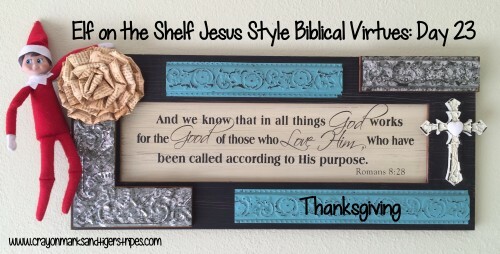 For this activity, print off the Praising the Lord and Giving Thanks Free Printable. 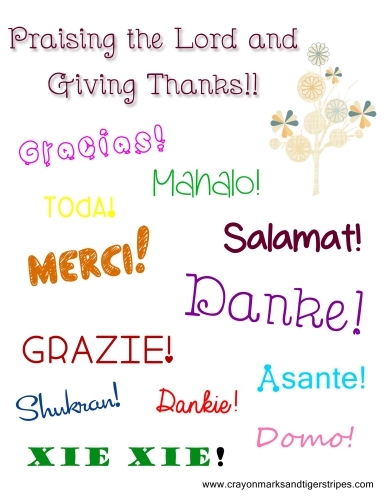 On this printable, you will find the word “thank you” in many different languages. Have your children cut out each word. As they are cutting, explain to them that people all over the world speak different languages, but even though we may say it differently, we can all praise God and thank Him for His many blessings. Practice saying the words together. You may even want to get out a map and as you read each word, point out where that translation comes from. As your child glues each word down on the construction paper, ask them to name something they are grateful for. Then together, praise God and thank Him for it! Here are the translations for the printable.